I must admit, I'm a bit of a petrolhead. Go back to 2000-2, I was heavily into betting on Formula 1, particularly head-to-heads. However, the constant rule changes which made driver ability a very small part of the equation eventually turned me off it. This season though, I could be right back into it. In summary, slick tyres are back, aerodynamics are significantly different to reduce reliance on downforce and make wheel-to-wheel racing easier, engines now have to last three races and in-season testing is heavily restricted. 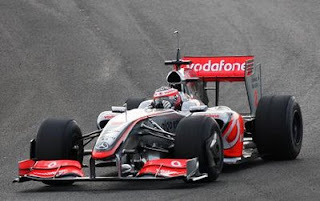 Just look at how different the McLaren car looks, the wings are a big change from previous years, front and back. The away races in Australia, Malaysia, China and Bahrain often tell a different story to the rest of the season. It's not until the teams return to Europe that they can really make changes to the cars and sort out early problems. F1Punter mentioned yesterday in his preview that Hamilton was nine pts behind Raikkonen last year after four races, yet ended up 23 pts ahead by year end. You don't win golf tournaments on the first day, nor drivers' titles in the first month. The drivers market is wide open (Betfair - Hamilton 5.9, Raikkonen 5.9, Massa 6.4, Alonso 6.4, Kubica 9.8, Button 11.5) but I just don't get into futures markets these days. Head-to-head betting on race day will have my focus. Hopefully the switch to BBC coverage in the UK will get the bookies offering even more markets, and not just matchups between drivers of the same make. Remember, this season no testing is allowed between races which will cause the kind of turnarounds we’ve seen in previous years to be less frequent. Also the new ‘most race wins’ wins rule will alter the way things work. Add to that the possible protest over three teams cars being ‘illegal’ and you will find some strange behaviour in the F1 markets over the next few weeks. A read of the market rules is in order if you don’t want your fingers burnt on Australian GP markets (as people found out in Hungary last year). is it a proper ban on in-season testing or just a gentleman's guideline that Ferrari will break when they start falling behind? No, a proper ban. The only testing that will happen is on Fridays at each race weekend. Of course cars may find a big jump forward with a new upgrade so you will still get these swings, but they will be more 'obvious' and quicker than the slowish development changes of last year which were harder to pick up on – ie. Everyone will see the same things quicker so you need to be even quicker to get in there before the good juicy odds get swallowed up! Thanks John. Any idea how much coverage the BBC will give to practice sessions? Full coverage thank god! Don't know if its just red button and internet or if they are showing on BBC3, but you will be able to see it all. Loads of other things happening also like all pit-car radios will be open to the broadcasters and fuel loads/pit stop times will be displayed. Makes it easier to read the races but thats a bad thing for me because i'm loosing my edge. no problem, any time I find useful material on another site, I'm happy to link to it.